Wild clangs of youthful squeals signal its Christmas time and that another Advent Calendar choccy’s been devoured; another bauble’s been hung or um… stood on (!) and another kids sleep over reluctantly agreed to. Fast forward to Christmas Day, and Busters Reindeer ears have been chewed again and those meticulously wrapped presents have all been ripped tape from limb! Oh the joys of Christmas! But our grandparents – the happy observers to all this chaos, creaking back in their favourite chair (the chair is creaking, not our… oh you know what we mean! )– are there too, glueing each generation together with a wise word and a knowing grin. 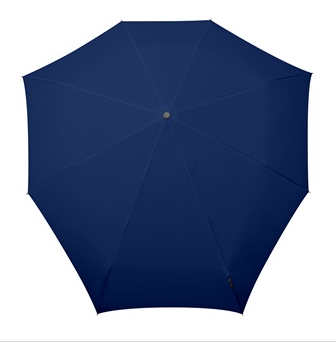 The active older gent or lady loves having a bit of outdoor kit to keep them dry. No-one wants their parade to be rained on, after all! Yet for whatever reason, a lot of umbrellas fall short when windy assaults are thrown into the mix. This award-winning model from Senz is fool-proofed against such mischief. The aerodynamic shape moves easily against the breeze, whilst it’s compact enough to remain stable in any weather. Grandparents can be rightly baffled by selfie sticks and smartphones. 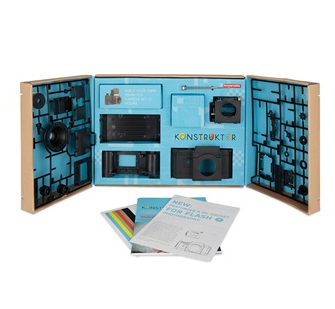 So bring photo-taking back to a hands-on, authentic hobby with the D.I.Y Camera Kit from Lomography. There’s everything you need to build a working camera, using 35mm to snap deep, richly-toned pics of their grandson’s goggle-eyed expression at the Christmas table. 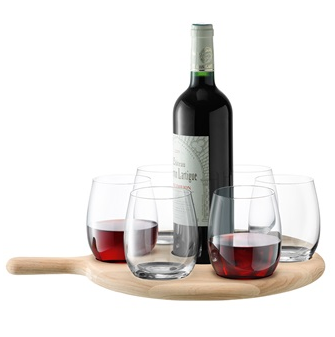 It’s never too late to boost someone’s hosting skills, and the Paddle Wine & Water Serving Set by LSA is a smart, beautiful pick-me-up for social butterflies. Each of the expertly-crafted glasses settles into the grooves of the paddle board, leaving space for a bottle as their nexus point. 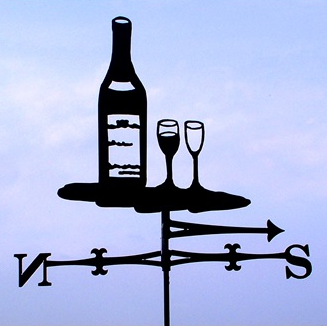 Bring them a splash of plonk by the fire, and you’re bound to stay in their good books! 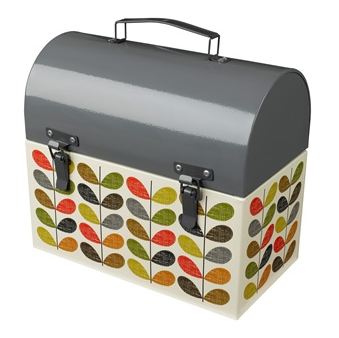 Tinkering nans and gramps will appreciate the Orla Kiely Tool Box, which features galvanised steel, a sure-fire protective measure against rusting over the years ahead. There’s enough space to fit smaller items in the lid, as it slides back on both sides underneath for extra storage. If grandad is mad about leaping to fix a leak or tightening the screws on his home-made bookcase, this is indispensable. Charm infuses every single one of The Profiles Range products, an armada of exquisitely designed brackets and weathervanes. This example of the latter comes in a gregarious, quirky wine bottle design. It’s crafted so the outlines have a hand-drawn effect as if a black pen has come down from the heavens to lick the roof of someone’s home. Easy instructions mean that the installation stage is pulled off without a fuss, letting your recipient gaze warmly on their weather loving gift. Cooking never gets old, and there’s probably something the grandparents haven’t tried yet, even if they’ve collected all of Mary Berrys Cookbooks. 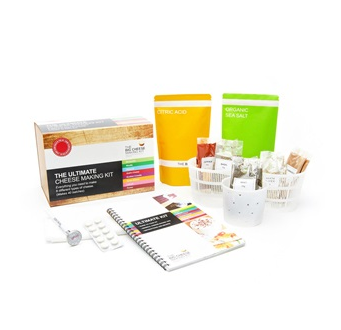 Cuckooland has found this awesome Cheese Making Kit so their afternoons don’t have any more holes in them. There’s enough ingredients for 40 helpings of mozzarella, halloumi and other obscure ends of the dairy spectrum, all packaged with the right pointers and equipment. For grandparents, it can seem the cold seeps into their bones quicker than it used to. Regular water bottles, though, are a little tired by today’s standards, especially when there’s a product like the PILL ready to melt someone’s heart. Dispersing heat across the body with a plush material that’s based on a wetsuit design, it’s far safer to fill up than its competitors, and it stays hot for roughly twice as long. Ideal for those who hate leaving their bed for the chill-strewn air. 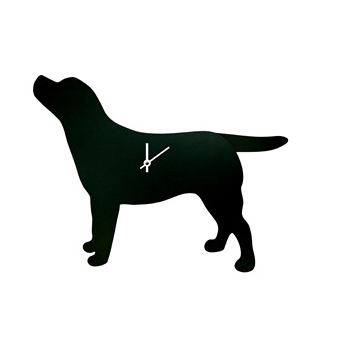 Grandparents can be barking mad and get away with it – why not celebrate that fact with a cute dog-themed clock for their kitchen or study area? The Labrador Company live up to their name with this poochy purchase, ticking off the seconds unfailingly with a twitch of Fido’s tail. The black silhouette look is brilliant for cream, orange and mint green interiors, and pet-owners will cherish its characterful shape forever. Seasoned couples doubtless have many musical memories together: a concert, a record session in their bedroom as teenagers, a stolen kiss to the sound of a band before Music Videos entered the scene. The Memphis Vinyl Turntable by GPO takes a lush, old-time aesthetic and transports it into the here and now, giving lovebirds a music station to sway to under lamplight. CD, MP3 and USB compatibility all slot into one package, ensuring no-one is left out of listening to their favourite tunes the way they prefer. 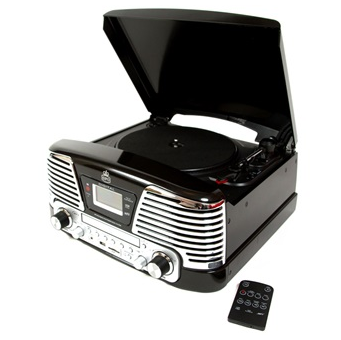 View our collection of retro record players here. Are you ready for our number 1 pick? It offers amazing value for money, enlivening the taste buds of anyone under the winter sun. Luxury hamper provider Virginia Haywood have unleashed this special collection for Christmas, stuffed full of ginger biscuits, fudge, popcorn, marmalade and a bunch of other irresistible treats. Let’s not forget the wine, either, which comes from California, bringing the complexity of heat-blasted grapes to the grandparents’ dinner table. It’s pipped all our other items to the post due to the broad nature of its appeal– truly, there’s not a mature person in the world who can resist something so generous, beautifully presented, and primed for their shared company. 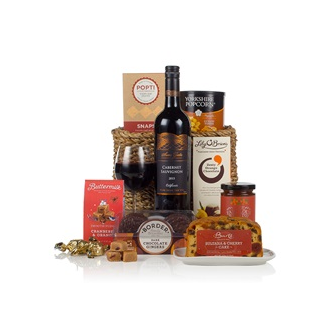 View all of our gift hampers here. We hope our short list at the very least gives you a few more ideas on how to make Grandparents feel super grand on Christmas. At the very least, we’re guessing that they’ll secretly adore taking centre stage for a spell, knowing that you value them more than you could possibly say. Need more gift ideas or suggestions? Give our Christmas elves a ring on +44 (0) 1305 231231 or view our full collection of Gifts for Grandparents here.